The Vancouver training is designed to help individuals to literally “speak in pictures” – to learn and practice skills concerning making thoughts, dialogue, systems and concepts visual. Stina will work with the group to build understanding regardless of where each student is entering this practice. Students will also develop skills around visual systems and design thinking and determine new ways of visually representing information for the purposes of communicating, teaching, facilitating, engagement, thinking and planning. Cost is based on a sliding scale for students, non-profits or professionals. Feel free to send Stina a note through the form at the bottom of this page. To optimize the creative potential of students as communicators, thinkers and facilitators through helping them acquire new levels of proficiency in visual literacy: being able to think and speak using space, color, size, composition, structure, movement and energy. 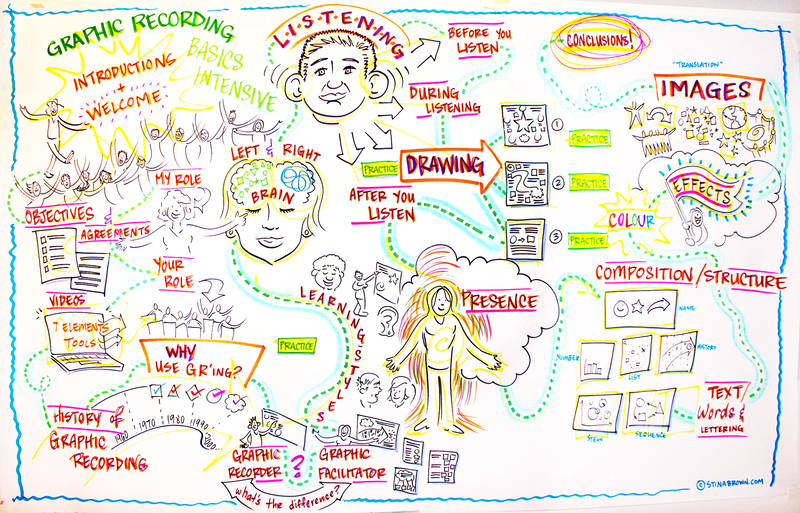 To shift from linear and sequential lines of communication (speaking and hearing, reading and thinking) to a way of hearing and seeing content in relationship – “the whole picture”: synthesizing, organizing and making connections between aspects of the content can add new dimensions of understanding, and create new ways to share complex matter with others. The length of the training depends on the needs of the client/group. Intensives can range from 6 hours to 2 days, depending how much your group wants to work with the material, practice and develop their own visual language. For example, some groups come to Stina to help them design a visual language – a set of images to represent common or complex language they work with – for their company, organization or initiative. Visual language is a fantastic way to engage more people in a conversation, explore and create common understanding, and visual language gives everyone a voice regardless of their language proficiency. It is also an excellent community or audience engagement tool. Contact Stina directly for details on how she can bring these skills in-house for your team or organization. Why LEARN Visual Thinking and Facilitation Skills? It is believed that people gain 75% of what they know visually. We work with ever-increasing complexity and need skills to filter, organize and synthesize information. With this skill set, you will develop your ability to translate inputs into meaningful visual hierarchies, make your meetings more creative and effective, use experiential learning techniques to amplify your ability to use both sides of your brain. We all, to some extent, think in pictures – but we hardly ever speak in pictures. This course sets the stage to change that. This experiential course is designed with multiple learning and social styles in mind. It helps to have some facilitation training and a basic understanding of working with complex ideas. There is no artistic ability pre-requisite for the course and you will leave with significant skills improvement regardless of your past training. What is the VALUE of Stina’s Intensives? Drawing on the wall for a group is all about professional listening. What is created, remains intact and tactile at the end of a long day of conversation. A silent supportive medium with bright expressive spacial relationships, artistic visual symbols: in essence, what unfolds in your meeting can become a visual language you ALL now speak. You can interact with it’s words and drawings as you like. Graphic recordings give ideas a place to LAND.